Cody Rhodes talks about his knee injury and plans for surgery. Cody Rhodes, the Executive Vice President for the newly found All-Elite Wrestling (AEW) has completed his commitment to NJPW, defending his IWGP United States Championship in a losing effort against Juice Robinson on January 4th. Cody is now set to undergo knee surgery to repair various issues that have been plaguing his knee for the last couple of months. In November 2018, Cody injured his knee doing a simple t-shirt throw spot before his match at ROH's Global Wars: Buffalo show. Cody claims to have heard a pop in his knee when he threw a t-shirt out into the crowd. He wrestled his match that night but had to pull out from the events to follow in those next coming days. He underwent an MRI which revealed both good news and bad. The good news being that he suffered no tears to his ACL, PCL, and MCL. The bad news? He did suffer a huge meniscus tear that will require him to undergo surgery. This may seem like a major setback for Cody, but in hindsight, it's just a minor bump in the road and a surgery that he needs to have before further damage is done. 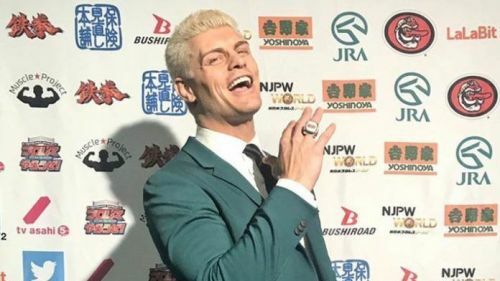 Cody talks about his upcoming surgery today on Twitter, following the events of NJPW's Wrestle Kingdom XIII. The surgery will set him back at least a good couple of months, but he will be back sooner rather than later, which is certainly great news. My knee is shot. I shouldn’t be walking on it, multiple meniscus tears. Complex/horizontal. As mentioned above, Cody will be undergoing knee surgery in the near future. In the meantime, All-Elite Wrestling (AEW) will continue with plans to hold a pep rally that will stream live on YouTube on January 8th near the same location WWE will be holding their SmackDown Live event. As always, continue to follow Sportskeeda for all the latest wrestling news and results!